Back at CES 2013, a start up touted its new on-screen keyboard as the solution to typing on touchscreens. Called Fleksy, this software promised predictions so accurate you can type without looking at the screen. Now that it's launched as a beta (using Google's new Play Store beta program), we have had a chance to put those claims to the test. Keeping in mind that this is still beta software, the setup process is a bit confusing and some devices have show-stopping bugs. 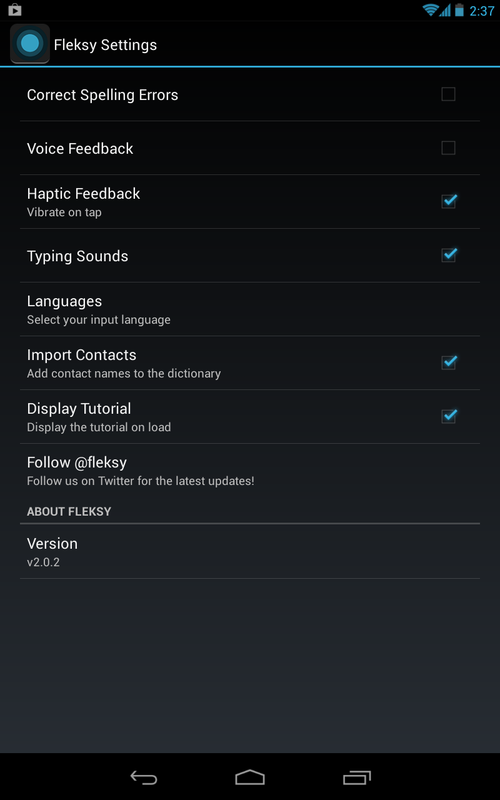 On the Nexus 4 and Nexus 7, Fleksy installed from Google Play without a hitch. The keyboard was enabled and ready to go after a quick trip into the system settings. The first time you open the keyboard, you're confronted with a bizarre thumbstick interface. It's not made entirely clear, but this is a visual aid to help you grasp the concept behind Fleksy. You tap on the keys as you would with other keyboards, but swiping is used to insert spaces, punctuation, and change word suggestions. After tapping out each word, you can swipe to the right to insert a space. 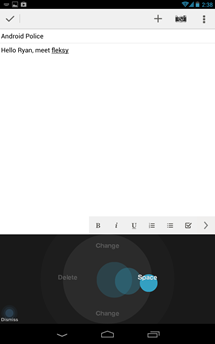 Another swipe gets you a period, which you can change to other punctuation marks by swiping up and down. A swipe to the left deletes the last input. The same gestures come into play when you need to change the word suggestion. 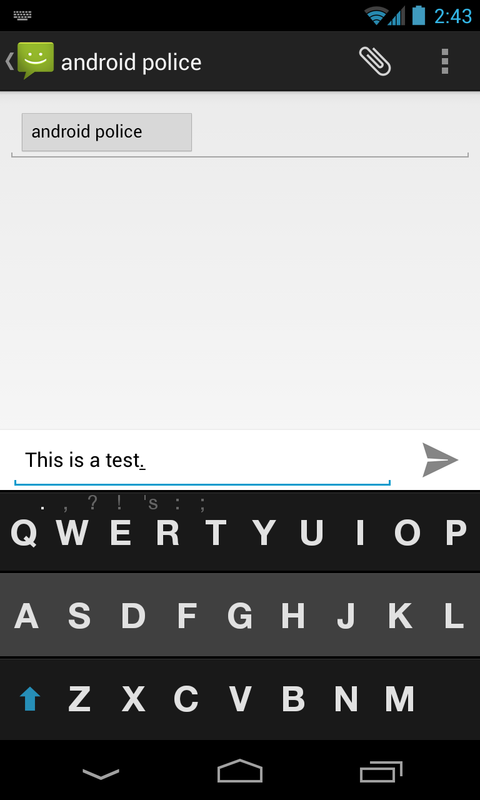 So if Fleksy gets confused, swiping up and down will cycle through the possible alternatives. 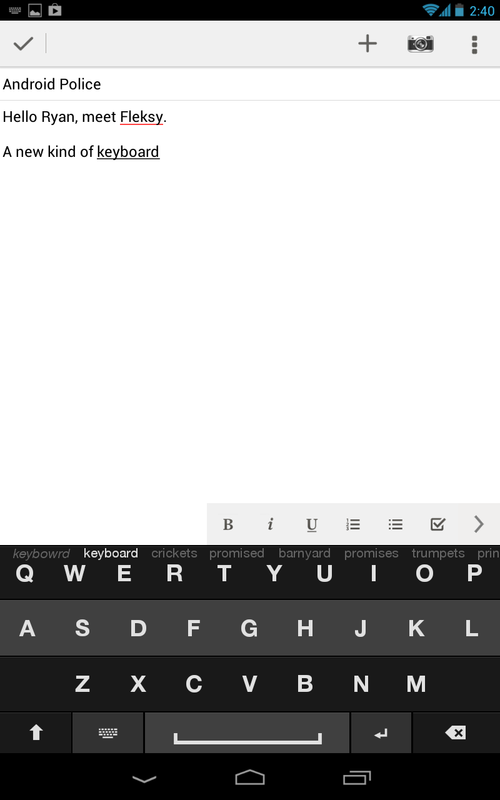 There is a suggestion bar at the top of the keyboard, but whatever word you typed will automatically be added to the Fleksy custom dictionary if you move back to the far left position, signifying you meant what you typed. 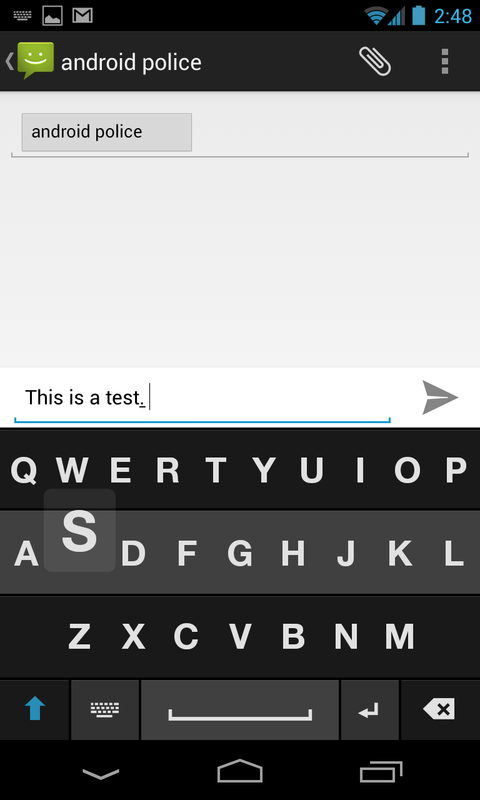 Fleksy starts out looking like a pretty standard keyboard with perhaps overly large letters. It takes up the same space as the alternatives, but that isn't even its final form! If you swipe down with two fingers, the keyboard collapses to display only the letters. So it loses the caps lock, space bar, delete, and enter buttons. 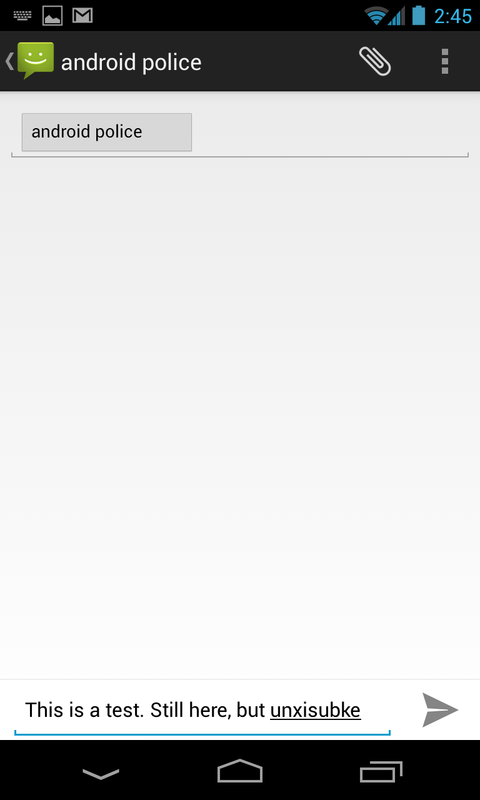 It takes up less space this way, and you can still bust out blocks of text with the letters and gestures. Swipe down with two fingers again, and Fleksy disappears completely. But this is just an illusion! Fleksy is still there, but invisible. You can continue tapping away in the general vicinity of the right keys (making use of the swipe gestures) and see how it goes. I will just point out again that Fleksy is a newly released beta app, but it doesn't quite live up to the hype – at least not yet. 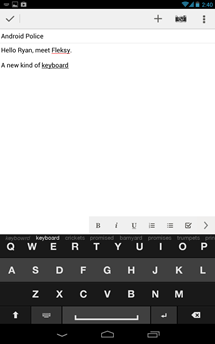 With the keyboard visible, it behaves kind of like a more sluggish version of SwiftKey. The swiping input for spaces and punctuation is hard to get used to. Although, I will cop to my muscle memory being a major component of that difficulty. It just doesn't make a lot of sense to swipe twice simply to get a period, and then swipe a few more times to place a comma or question mark. When you move to the hidden keyboard, the app still pops up letter imprints to help you stay on the right track, and it is very neat to see the entire screen while inputting text. However, the transparent keyboard covers the buttons in some apps (like Hangouts and Messaging/SMS). 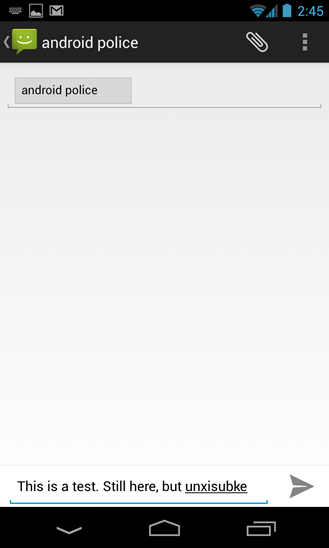 The suggestion bar also floats in the middle of the screen – it would make more sense at the bottom. I suspect there will be some kind of work around for this eventually, but again, this is beta. The quality of the suggestions is sometimes jaw-dropping. 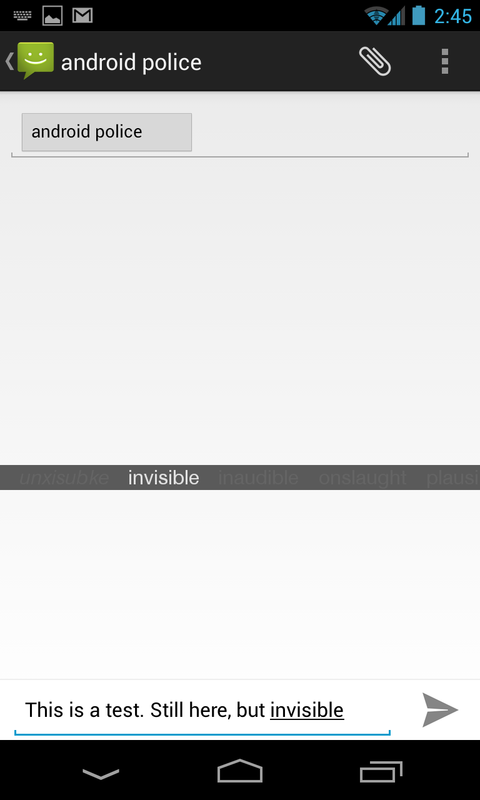 The first time I tried the invisible keyboard, I was able to crank out a sentence without too much trouble. However, you need to have a very good intuitive grasp on the location of the keys. Fleksy is smart about corrections, but your presses have to be somewhere in the right neighborhood. The full keyboard is required to access special characters and handle proper capitalization, though. 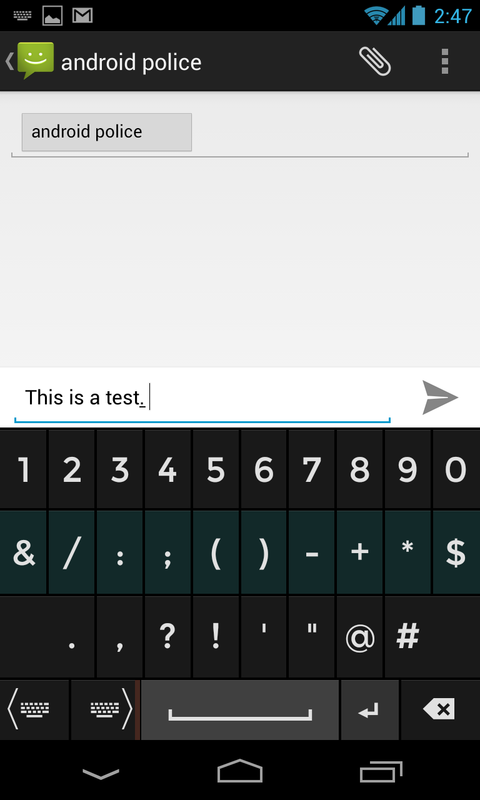 There are times when using Fleksy that I missed every letter in a word, and the app still got it right. I'd say it guesses correctly about 90% of the time when using it in hidden mode. The problem is that 90% isn't quite enough to justify switching from another keyboard. Fleksy is just frustrating enough that I don't relish using it. The swiping also ends up a bit tedious when it's not hidden. 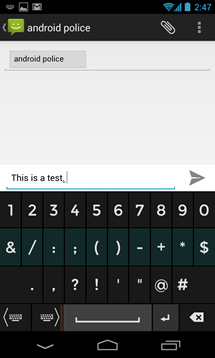 The technology behind Fleksy is fascinating, and I believe it could become something cool as development continues. If you really want to see what it does, tapping the version number 10 times in the settings will expand the invisible keyboard to fill the screen so you can type anywhere (requires three downward two-finger swipes). Users with low or no vision might find this kind of aggressive text prediction more useful in the long run (it includes voice feedback). 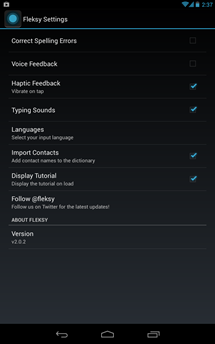 For now, Fleksy is something to watch. 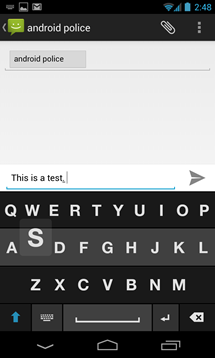 If you want in on the beta, check out the Fleksy Google+. Keep in mind the app in Google Play won't be accessible unless you're in the beta.